The first Expo dates back to 1851, at the Crystal Palace in London. He followed that of Paris, the Eiffel tower which still remembers every tourist, and gradually all the others to the present day, all linked from being organized around a central theme declined in many shades. The nutrition of the planet is the theme of Expo Milano 2015: being able to provide healthy food, safe and sufficient for all peoples, respecting the planet and its equilibrium. An exhibition area of 1.1 million square meters, more than 140 countries and international organizations involved, more than 20 million visitors expected. An opportunity to reflect, an opportunity to discuss, an opportunity to visit Italy and to know Milan in all its hidden corners. For the duration of the event, the city of Milan and the Expo site will be animated by artistic and musical events, conferences, performances, workshops and exhibitions. We wish to everyone this fascinating tour of the world in a day or two or three ... how many are the times that in six months you will meet the world. 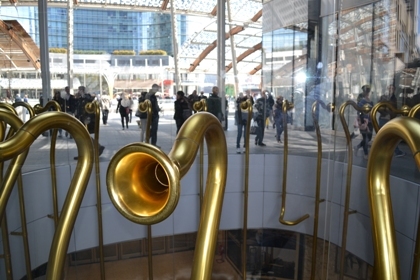 From May 1 to October 31 on the platform Milan. And for the rest of our days every day around us, keeping the spirit of universal openness that we will learn to make our own in the next 6 months.